I've been working patiently down my list of books from BEA and requests. And I couldn't wait to get to this book. Damaris, you guys know Damaris. Well she ranted and raved about this book. So I was looking forward to it. And for once in a long time. I can't say I agree with her. And I'll tell you why. Wren was finding it hard to continue living without the love of her life Danny. She was having a hard time letting go of her dead boyfriend. They basically were attached by the hip. That was until Danny was killed in a car accident. Leaving Wren grieving like a teenage widow. And like anyone who grieves for a lost one, she secluded herself from friends and family. She was dealing with the lost her own way until one day she did the impossible. You see unlike any other teen, Wren has powers. And by using her powers she brings her dead boyfriend back to life. But what Wren didn't expect was the Danny she brought back to life was not the Danny she fell in love with. While she had him under control when she first brought him back to life, he was now becoming unpredictable. Not only was having Danny around becoming hard, but she was having problems with her friends. They demanded her time when she wasn't ready for them. But the biggie here is meeting this new boy Gabriel that sparked something in her that she did not want. And as much as Wren tries to push Gabriel away, he isn't going away so easily. He knows she's different and he's not giving up. He's in it for the long haul and he's there to help her get through her grief. But she has to deal with the consequence of her bringing Danny back to life, she has to figure out what do do next. This was a good read. I didn't weep or get teary eyed like Damaris did, but it was indeed a sad story. My bff lost her fiance months before her wedding and I was there for her when she felt like she couldn't continue life without him. So I understand the pain Wren was going through. I liked this book but I wasn't blown away so I give it a 3 stars. I recommend it to those who enjoy reading a grieving love story with a little magic. I was surprised by how much I ended up loving this book. As much as I love paranormal books, I really liked how subtle the magic aspect is in the story, yet how important it is. I also love Ms. Garvey's writing--it's so poetic. Hmm, I think I'll check this book out. I love that last sentence - "a grieving love story with a little magic." So nice! Sounds like a book I'd enjoy so adding it to my TBR list! I hope I like it - even though it wasn't entirely for you, you still did enjoy it, so I'm sure I will too! :-D It's interesting how a book just doesn't work for everyone, huh? Thanks for sharing! 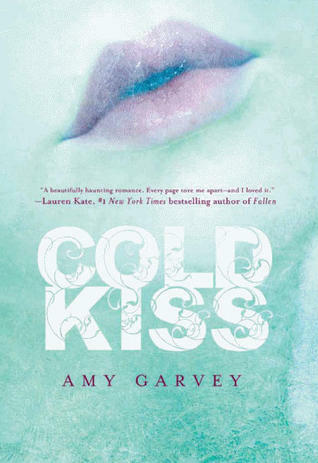 Cold Kiss doesn't have a normal love triangle and I am kind of glad for that. I've heard a lot about this book. The subject seems so original and intriguing, I can't wait for this one!! @Dj D- I really don't understand why there would be a sequel. The book pretty much ended. Yeah that's so true. But since word of mouth is so powerful. You have to check out what's so popular out there. @TheRainHouse- Yeah I did like how the author played that. Aww only a three. This book has been everywhere so I thought it would be great! But I will check it out anyways. Thanks for the review. @Smiley- But it's got really great reviews from others. This one is simply my opinion. Damaris LOVED this book.